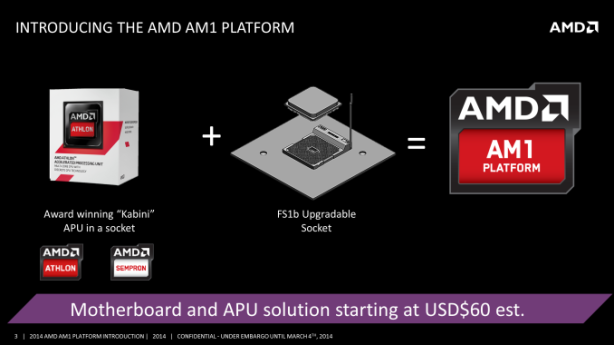 AMD has announced a new addition to its platform range with the low-cost, low-power AMD AM1 platform. 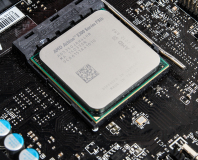 The new platform is based on the existing Kabini processors that AMD introduced earlier this year and which are meant for use in portable form factors like laptops and tablets. However, where those processors are generally soldered to the board the AM1 platform uses an interchangable socketed processor mounting. This new mounting is called FS1b and it looks just like a smaller version of AMD's existing socketed platforms, with CPUs incorporating the pins and the motherboard providing the sockets. This is in contrast to Intel's mounting system which uses flexible pins in the motherboard socket and gold pads on the CPU itself. 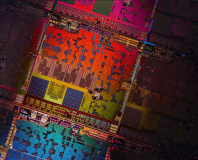 AMD is aiming at creating a platform which can provide both a CPU and motherboard for around $60 yet still provide upgradeability. This is in response to emerging markets which have requested upgradeable low-cost systems. In comparison, an FM2 system can be had for around $90. 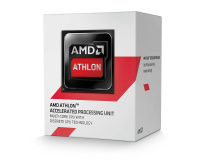 AMD already has on board most of the major motherboard manufacturers, with stock already in stores. Most will be microATX with a couple of mini-ITX options available too. The Kabini processors are essentially variations on their laptop counterparts with up to four Jaguar based CPU cores, a single memory controller supporting up to 1600 MHz memory and a GPU element with128 streaming processors from the Graphics Core Next architecture. 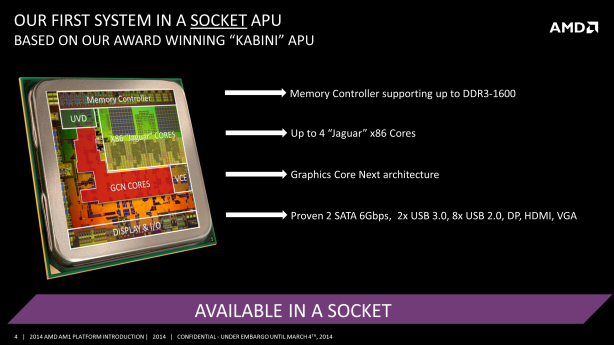 This is an SoC style chip so there is no chipset on the motherboard and all IO is on the CPU itself. This will consist of two SATA 6 Gbps ports, two USB 3.0 ports, eight USB 2.0 ports, four PCIe 2.0 lanes and a trio of video outputs (DisplayPort, HDMI, and VGA). As the four PCIe lanes will have hinted at, this is a platform unsuitable for high-end graphics cards, with support for dual-graphics not on the cards either. The single-channel memory will also be quite limiting when it comes to overall compute bandwidth. CPU overclocking will also not be an option, though limited memory overclocking may be. Also confirmed is that there isn't likely going to be an 8-core variant with limited GPU or a dual-core version with a larger GPU - AMD is focussing on quad-core only. The new platform's main rival is the desktop version of Intel's Bay Trail. 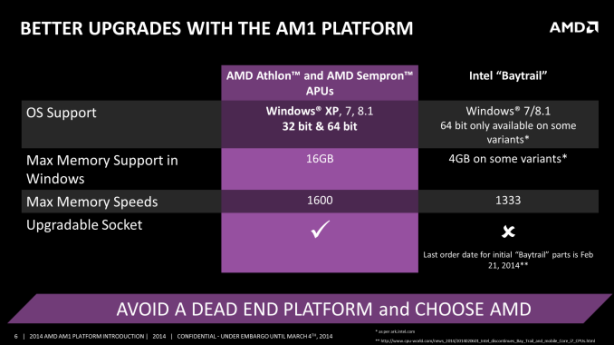 As AMD rightly points out, the main advantage of AM1 will be that it is upgradeable where Bay Trail is not. However, Bay trail is also a lower-power platform - 10-15W compared to 25W - and it supports dual-channel memory. 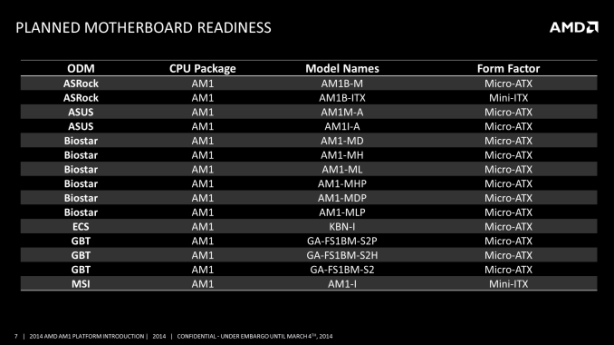 AMD AM1 motherboards are already up on some etailers though the official release date isn't until April.